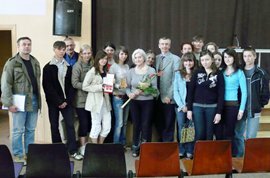 First, in the morning hours the meeting with students took place. They had a chance to learn about the common history of Poles and Jews as well as the places of extermination. Mrs Jadwiga Gawrych told the story of her family who rescued Jews during the occupation. 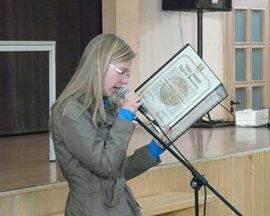 She also presented “The Righteous of the Nations of the World” medal and diploma. 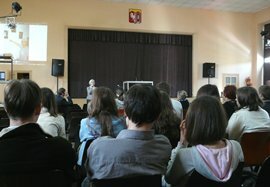 In the afternoon The Lasting Memory Foundation organized an open meeting for inhabitants of Zelów. The mayor, Mr Sławomir Malinowski, said that the city has been built thanks to common life and work of many nations. During the Nazi occupation the three thousandth Jewish community was almost completely destroyed. Local authorities intend to preserve the memory of the past. After Mr Malinowski’s speech Zbigniew Niziński delivered a lecture which concerned the trips following the traces of Jews in Poland. Mrs Jadwiga Gawrych told the story of her family who rescued Jews during the occupation. 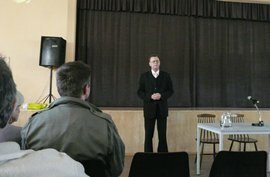 The inhabitants had a chance to share their memories of Jews from Zelów.